Warning: All pages in the Arcade / MAMEsection are still a work in progress! I’ve tested the instuctions on multiple systems and haven’t had any trouble, but it will take time before enough people confirm their results to remove this warning. If you follow these instructions, please let me know how they worked for you. This page describes how to create a Windows-based front end for your MAME arcade games, as well as other emulators. This front-end can be used with a controller, or a keyboard and mouse. This will also include generic layouts that are compatible with all common resolution screens (240p, 480p, 720p, 1080p) that will make your arcade cabinet or gaming machine look awesome! It’s not as flashy as other front ends, but it’s basic and easy. This page is the “manual setup”, which includes detailed instructions on how I created the RetroRGB MaLa Front End. You can use this to learn how to create your own, or simply learn more about MAME and MaLa. If you’d prefer to just download a pre-configured MaLa setup, please see the easy setup page. – I highly recommend starting with a bare installation of Windows 7. Windows 8 may work, but it’s untested. Windows XP will work, but I’ve had issues with USB controller configuration in XP. – I recommend a 32-bit installation of Windows, however it has worked on Windows 7 64-bit. – If possible, try and choose a controller before starting this project, as the majority of the work in this guide is setting up controller mappings. People using X-Arcade controllers will have the easiest time, since there is already a config file available for MAME. – It’s easiest to configure MaLa in a resolution that’s higher than 240p. If you plan on using your setup in 240p, it’s best to configuring everything in 640×480 (or higher), test the setup, then switch to 240p as the final step. – A Zip utility called 7-Zip. Install this, even if you already have a zip program – it will not interfere. – If you’re using an X-Arcade controller, download this file. – Open the MaLa official build with 7-Zip and extract the MaLa folder (not the sdk) to the “C:\Arcade” directory. – Rename the MaLa folder to “mala” (it’s probably named “MaLa174” or something similar). The path to the mala exe file should now be: “C:\arcade\mala\mala.exe”. – Open the beta version of MaLa with 7-zip and extract the MaLa.exe file to the mala directory, overwriting the original file. – Extract the mame file to “C:\arcade\mame”. The path to the mame exe file should now be “C:\arcade\mame\mame.exe”. – Copy at least one rom to the “C:\arcade\mame\roms” directory. You can get free MAME roms here if needed. – Extract the RetroRGB MaLa Layouts to the “C:\arcade\mala” directory (they should be in the root MaLa directory, not a sub-directory). – Go to the “C:\arcade\mala” directory and create a shortcut to “mala.exe”. Copy this shortcut to the “C:\arcade” directory. Trust me, this will come in handy later. – Launch MaLa and hit “ok” to any prompts until the Options menu appears. – The first page that appears is MAME Config\Basics. Use the “…” button to set the path of the MAME executable to: “C:\arcade\mame\mame.exe”. – Hit “Yes” to create a standard mame ini file. – Hit “Yes” to create a mame xml file. – Use the “…” button to set the rom path to “C:\arcade\mame\roms”. – Hit the “Game Collecting Options” button and and check off “Only games with rom found in rom folder(s)” and hit “ok”. – Set the Dos Windows state to “Hidden”. – Click on the GUI tab and set the layout to the closest match to your system. – Click on the “Options” (under GUI) and then the “Pictures and Videos” tab. Check off every option except “Disable video sound” (unless, of course, you really don’t want sound) and then set the “Play Video Once” drop-down menu to “hide”. – Hit “OK” in the main options window. – A box should pop up saying “Your configuration has changed! Refresh main game list?”. Hit “Yes”. – Wait patiently as it scans your folder. This will take at least a minute, even if you only have one or two games in the roms folder. – You’ll see an error that says “No Controls.ini file set”, just hit “ok” and wait until it finishes. – It should now bring you to the MaLa GUI and show the roms you’ve installed. – If it shows “All Games: 1 out of 29249” (or something similar), right click anywhere and hit “Options / Configuration”. – Hit the “Game Collecting Options” button. – Check off “Only games with rom found in rom folder(s)” and hit “ok” in both boxes (I realize you just did this, but sometimes, for some reason, it needs to be done twice). – Refresh the main game list and wait just like you did last time, with the same prompts. – Use your keyboard up and down arrows to select a pre-installed game and hit the number 1 key to launch. – At this point, MAME should launch; It will ask you to type “OK” to continue, then hit any key to launch the game. – If it works, the installation is successful and you can continue with controller configuration. Hit Escape to exit MAME and return to MaLa. – It’s best to plug in the controller you plan on using before launching MaLa (I actually recommend attaching the controller before even powering on the machine). – Click on the “Controller” tab, then the “Joystick” sub-tab. – Check off “Use Joystick”. – Click on the “Check” tab, to test your controller and write down which buttons correspond to each number. If you’re using an X-Arcade, this may not work; The buttons on the X-Arcade may show up as keyboard buttons. If so, uncheck the “Use Joystick” box you just selected and go to the “Controller\Keyboard” tab. – Go back to the “Basic” tab and select the buttons you want to use (or the “Controller\Keyboard” tab, if you’re controller shows up as a keyboard). – I suggest making the “Menu Select” and “Exit Menu/MaLa” buttons the same that you’ll want to use for select and exit in your arcade games. – I also suggest making “Start Game” and “Menu Select” the same button, as it’ll make things easier. You should now be able to use your controller (as well as the keyboard) to control MaLa. As an FYI, Hitting “Exit Menu/MaLa”, then “Menu Select” will exit MaLa. – Select any game and launch it. FYI: X-Arcade controllers should already be configured for MAME, but I still suggest X-Arcade users read this section for info on how to customize buttons. – After launching a MAME game, press TAB on your keyboard and the MAME config menu should pop up. – Select “Input (general)” to configure the global control options. – Make sure to map the following buttons and write down your configuration! – Highlight “Config Menu” and hit enter. – Hit the button you’d like to map. UI Select: To keep things easier, you should map this to the same key you selected for “Menu Select” in MaLa. I also use this same button for 1-Player-Start, but that’s a matter of preference. Once again, to double-map, follow the instructions above. UI Cancel: This is the button you’ll use to exit MAME. To keep things easier, you should map this to the same key you selected for “Exit Menu/MaLa” in MaLa. Once again, to double-map, follow the instructions above. – Configure any other button, then hit escape to go back to the “Input (general)” menu screen. – Select Player 1 controls. – Map every button for player 1. I suggest mapping “P1 Start” to the same button as “UI Select”, but it’s your preference. – Hit escape when you’re done and map any other player controllers you’d like. – When you’re totally done, keep hitting escape (or whatever you mapped to “UI Cancel”) to go back to the game, or exit. As an FYI, you can map controls for individual games by hitting TAB, then “Input (this game)”. Most arcade games only use a few buttons, so using basic “button 1 / button 2” configurations is fine. That being said, games like Mortal Kombat and Street Fighter need the correct button layout, so you’ll want to map the proper buttons for each of those games. – Copy all your MAME roms to the “C:\Arcade\mame\roms” directory. This setup package uses MAME v0.153b, from April 2014, so make sure the roms you download are compatible with this version. – I suggest your MAME roms be .zip. If they are .7z, they might cause problems launching. If so, simply copy this file to the “C:\Arcade\mame\roms” directory and run it (7-zip must be installed for it to work). That file will convert all the roms to “.zip”, so please make sure you have a backup of them, just in case something goes wrong. – Right click anywhere on the screen and hit “Refresh Main Game List”. This will take at least one full minute. – If you see an error that says “No Controls.ini file set”, just hit okay and wait until it finishes. – All of your games should now appear. Any time you add or remove a game, you’ll need to hit “Refresh Main Game List”. 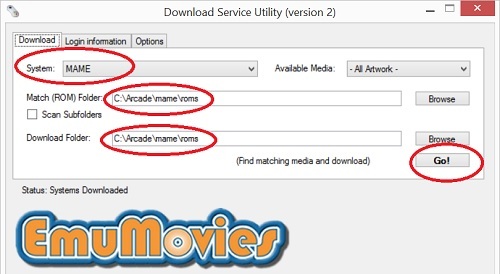 – Launch the EmuMovies service and log in. – Make sure all options are not checked off. – Select “- All Artwork -” from the other drop-down menu. – After it finishes, select “Video_MP4” from the Available Media drop-down menu. – Hit “Go!” a second time. – Drag your Windows taskbar to the top of the screen (instead of the bottom like normally). Then set it to “auto-hide”. This will prevent it from popping up and requiring a mouse to run your arcade machine. – If your preview videos don’t play, make sure you installed the Combined Codec Pack. – You can set MaLa to shutdown your computer on exit, which is perfect for arcade cabinets. Just go to the “Options \ GUI \ MaLa Exit” tab and select your preferred exit method from the drop-down menu. – There is pretty much zero support for MaLa on the internet. If you’re looking to do anything special with it, you’re pretty much on your own: Just keep poking around and hope you can figure it out. Also (and I’m sorry to say this), but please don’t email me about MaLa support…there’s just too much going on in each installation, making it almost impossible for me to support. – If you’re using a VGA monitor, I recommend setting it to 640×480, as it’ll be the correct aspect ratio and closest resolution to the original. – In my setup, I loaded a ton of games and created favorite game lists for each one. This is a pain to figure out, but might make things easier for you. Honestly though, a better way is to only load the games you’ll use. These instructions showed you where to extract and name the MESS and Mednafen emulators. For more information on how to configure them for each system, please check out my Other MaLa Emulators page. X-Arcade Tankstick With Trackball NEW in BOX CHEAP CHEAP!! X-Arcade Dual Joystick, NEW, Includes Trimode Upgrade PCB. One Year Warranty.